Payments can be made in the form of a check, cash, Visa, MasterCard, Discover, or American Express. A deposit of 50% is required to reserve your fishing charter, with the remaining balance due upon the completion of the trip. You may cancel up to two weeks before your charter for a full refund. Otherwise your deposit will be applied. Although tipping is not mandatory, it is customary, and appreciated to tip the mate 15 to 20%. Blackfish (Tautog), full day $150 per person. Maximum 6 person. For sailing regattas, race boat committees, photography excursions, music festivals, sea diving, etc… We can accommodate up to six people. ($550 minimum reservation fee): 5-6 people: $110 per person. For more than 6 people contact Captain Joe for details. Half – Day Newport, Rhode Island Fishing Charters | 8:00 a.m. – 12:00 p.m. or 1:00 p.m. – 5:00 p.m.
We can accommodate up to 6 passengers, minimum fee $550. Full – Day Newport, Rhode Island Fishing Charters | 7:00 a.m. – 1:00 p.m.
To make a reservation or to learn more about how Sara Star Fishing Charters in Newport, Rhode Island can meet the needs of your special occasion fishing adventure please contact Captain Joe Aiello 1-401-623-1121 . 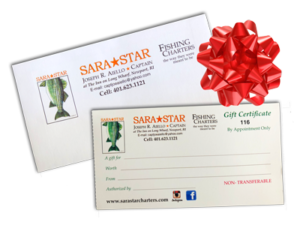 Sara Star Fishing Charter Service has not increased its prices for 2018. However, if fuel costs go above $4.00 per gallon, an extra ten percent (10%) will be applied to your total cost. Load More...Follow Sara Star on Instagram! Theme by GeneratePress. Site copyright Sara Star Charters 2019.